A crumble with a difference. 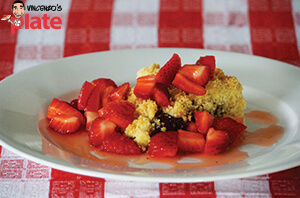 This is a rich, flavoursome dessert for lovers of strawberry jam and crunchy pastry! 3 large strawberries – sliced into triangles and placed into a bowl. 1 x средняя форма для выпечки тортов - лучше, если она не прилипает. 2. Pour the lemon juice over the top. 3. Mix the sugar and lemon through the strawberries until they become nice and shiny. 4. Place this into the fridge until the cake is ready to be served. 5. The more lemon juice you add, the more liquid will be created from the strawberries. 1. Using a piece of the butter, rub it all over the bottom and sides of your baking pan, lining it so your cake doesn’t stick. (You can use baking paper at this point if you like, but I prefer my Nonna’s method). 2. Pour a small amount of flour into the centre of the baking tin. 3. Lift the tin up and lean it slightly on its side while tapping the side of it so that the flour starts to stick to the butter and also lines the tin. 4. Continue, by turning the tin slightly and hitting it on the other side. 5. Do this until the flour has spread over most of the tin. 6. Sift the rest of the flour into a large mixing bowl. 7. Add 150g of white sugar, the powdered yeast and the vanilla (or vanilla essence). 8. Mix this together with a wooden spoon. 9. Add the grated lemon rind. 10. Put the rest of the butter in the bowl (You can cut this into large cubes if you prefer). 11. The next step is the key to the crumble! Mix the ingredients together using your hands. 12. With each hand, grab hold of the mixture and squeeze it with the butter, using your thumb to help break down the mixture in the rest of your hand. 13. Crack the egg into the mixture and continue breaking it down for at least ten minutes or until you are left with a bowl of crumble. 14. The crumble should be uneven with some larger than others. 15. Sprinkle a portion of the crumble into the bottom of the tin to make the base of your cake. 16. Make sure you cover all the edges and make it approx. 2.5cm high. 17. Pour your jam into a separate bowl and mix it together so that it is not too lumpy. 18. Pour the jam into the centre of your cake and be careful to leave space around the rim of the cake, don’t make it go right to the edge. 19. Spread the jam so that it is as even as possible and not higher in some places over others. 20. Sprinkle the white chocolate buds over the top of the jam. 21. Spread the rest of the crumble mixture over the top of the jam, being careful to first fill in all the gaps around the edge and covering the inside completely. 22. Place the crumble in the oven for approx. 40 minutes at 160 degrees. 23. Remove the crumble from the oven and let it rest for ten minutes. 1. Take the strawberries out of the fridge. 2. Cut a slice of the crumble carefully. It should be hard on top but may break slightly through the centre as it’s pretty delicate and full of jam. 3. Place it onto a flat plate and using a spoon, add some fresh strawberries and pour the liquid over the top, adding even more colour and some yummy topping to the dessert. This can be eaten warm or cold but is delicious with fresh mascarpone or a scoop of hazelnut (Nocciola) gelato! E ora si mangia, Тарелка Винченцо ... Наслаждайтесь!